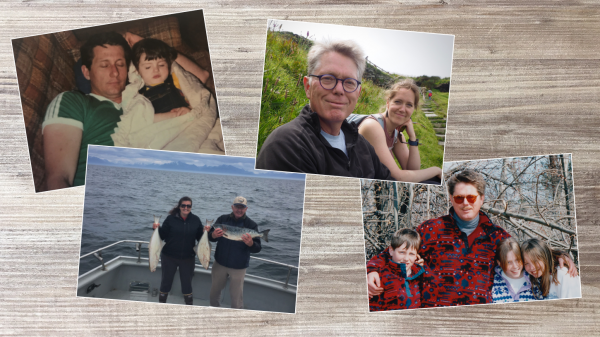 Father’s Day celebrates the dads in our lives, but for some, it’s a reminder of pain and loss. The Dinner Party is an organization that connects people grieving the loss of a loved one. This Sunday they’re sharing stories on social media from the thousands of Dinner Partiers all over the world whose dads have died. Kami Miller is standing in her kitchen over a bright blue pot of boiling water. She says she wants to be clear about one thing. “I don’t fancy myself a cook,” Kami said. Instead, she said she likes to experiment. The recipe is for Chicken Florentine. Kami turns to the sizzling pan on the side burner. “Do you like spice in your food?” she asked me. “Alright let’s add some ‘Kickin Chicken,'” Kami said. This is just the second time I’ve met Kami. Both meetings began with a hug. We were first introduced over email by The Dinner Party. It’s this organization that connects people in their twenties and thirties who have experienced loss and grief. Becca Bernstein is the The Dinner Party’s Community Organizer. Becca hosted dinners for two years before coming on as staff. “We’re in over 100 cities now across the world– everywhere from California to Amsterdam in the Netherlands,” Becca explained. Becca said the group realized a lot of Dinner Partiers who’d lost someone they loved had specifically lost their dads. So on Father’s Day, they’re publishing stories on social media about some of those dads. 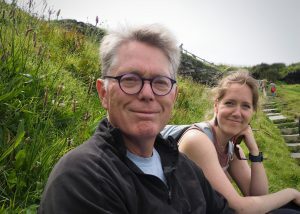 For Kami, a lot of those stories she has with her dad, Steve Miller, are about birds. 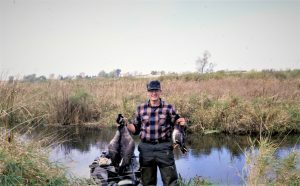 He worked for decades as a wildlife ecologist for the Wisconsin Department of Natural Resources. Sitting around the dinner table, Kami told me about a trip to Alaska her dad took right after retirement. It was a dream trip, she said. He came up for a whole month in the summer of 2016. Kami showed me a photo of her dad. He’s got a salmon in his hands and a smile across his face. On her dad’s last night in town Kami called to see if he wanted to get dinner, to cap off the great month. He didn’t pick up, so Kami drove to where he was staying. It was sudden cardiac arrest. Kami’s dad died on Aug. 8, 2016. The next few hours were a blur, she said. The police showed up and asked if there was someone they could call. But as the first person to find out about her dad’s death, Kami did have to make a phone call. She had to tell one of her sisters. 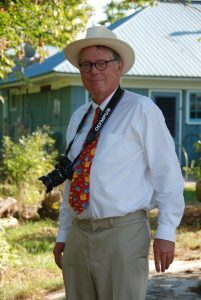 I took a video of my dad, Mark Russell, a week before he died. He’s wearing a white tee shirt tucked into khaki shorts. His legs look like toothpicks, but he’s smiling walking down the sidewalk in the September sunshine. He had just been released from the hospital after having a heart attack and he thought he was in the clear. He died of sudden cardiac arrest on Oct. 1, 2017. “It should have been 20 years from now,” I said to Kami at dinner. “People experience the death of parents, but it shouldn’t be when you’re a teenager or when you’re in your twenties or thirties and haven’t been married, haven’t had kids, haven’t bought a house,” I said. My dad will never see me do those things. Kami’s dad won’t either. 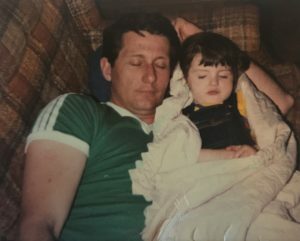 We talked at dinner for more three hours — about what we miss, what we remember, what we regret, and why it’s so important to keep the stories of our fathers alive even after they’re gone. “Well cheers to our first dinner party,” Kami said. “And to our fathers,” I added. “And to our fathers,” she agreed. Emily Russell is the voice of Alaska morning news as Alaska Public Media’s Morning News Host and Producer. Originally from the Adirondacks in upstate New York, Emily moved to Alaska in 2012. She skied her way through three winters in Fairbanks, earning her Master’s degree in Northern Studies from UAF. 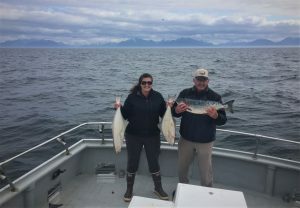 Emily’s career in radio started in Nome in 2015, reporting for KNOM on everything from subsistence whale harvests to housing shortages in Native villages. She then worked for KCAW in Sitka, finally seeing what all the fuss with Southeast, Alaska was all about. Back on the road system, Emily is looking forward to driving her Subaru around the region to hike, hunt, fish and pick as many berries as possible. When she’s not talking into the mic in the morning, Emily can be found reporting from the peaks above Anchorage to the rivers around Southcentral.